My dad sold his electric bass to buy my crib. Somewhere in the vast, expansive ocean that is music, his sacrifice nurtured a classical, symphonic bass player. That’s where my story begins. I don’t know what the next chapter will bring, but I can tell you that Mobile Symphony changed my life. I discovered that I loved the double bass in the fifth grade. An orchestra teacher in Texas who didn’t even know how to play bass enticed me with those ominous first notes from Jaws. When the military moved my family to Mobile, I found the Mobile Symphony Youth Orchestra. After a couple of years in the MSYO, the director encouraged me to apply to the University of South Alabama. I went to South because he was there, and I continued my involvement with the youth orchestra by serving as a collegiate mentor. 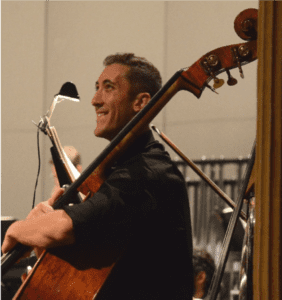 During an orchestral performance at South, Mobile Symphony’s Juilliard-trained principal bass player, Taylor Hollyer, performed next to me. At that time, I didn’t fully understand what Juilliard-trained meant. I heard him play, and I thought, ‘I want to sound like that.’ I told him I was almost ready to start performing with the Mobile Symphony. I wasn’t ready! I found that out. Taylor began giving me weekly lessons. Playing in the low strings with Taylor Hollyer is like having a legend sitting up in the bass section. He plays and my jaw drops. Looking back now, it seems like everything I’ve done should have been impossible – I didn’t even know how to hold my bow when I auditioned for the MSYO. I don’t know much about money, but I’ve heard it moves mountains. When you support the Mobile Symphony, you support kids like me in the MSYO figuring out their own musical place in the world. You also keep me and 84 other Mobile Symphony musicians on stage. I feel like the Mobile Symphony’s potential is limitless, but we need your help to keep the music playing. Please donate to Mobile Symphony’s spring appeal. Donate today. An investment in the MSO is not just a tax write off, it is an investment in your community. By donating to the arts, you are enriching the world around you.